Cruiseship passing Venice. Photo by Wolfgang Moroder, via Wikimedia Commons. Available under a CC BY-SA 3.0 license. The summer is over, but the holiday season hasn’t stopped. Going on vacation is how many people calm down from a hectic work life and enjoy a good time. Cruise ships offer this experience all year round in the most naturally beautiful holiday destinations in the world: from the Arctic Circle or the Norwegian fjords to Mediterranean beaches. The urge to explore the world by cruise ship and see spectacular natural beauty has risen dramatically. Around 25 million people will board cruise ships this year, meaning the demand for such luxurious vacations has increased more than 68 percent during the last 10 years. Maybe you too would like to go on a cruise, but think twice: while you may be expecting to enjoy the fresh sea breeze, you are more likely to end up breathing in toxic pollutants. Everyone is talking about the VW diesel scandal and the dirty car industry, where diesel’s suitability as a fuel for cars has recently been called into question, but standards for the cruise-ship industry are even lower. Heavy fuel oil, a cheap by-product of petroleum distillation, is still the norm on all cruise ships. On land, heavy fuel oil would be classified as toxic waste but offshore it is used as an energy source. The German Federal Environmental Agency has classified this practice as “offshore toxic incineration.” Due in particular to the fact that heavy fuel oil is half the price of marine diesel, it is still the main energy source used by the shipping industry. In addition, filters don’t work well with heavy oil fuel because it is simply too dirty. Thick black smoke billows from the Sun Princess. Photo by Jason Thien, via flickr. Available under a CC BY 2.0 license. A medium-sized cruise ship produces around the same volume of air pollutants—including greenhouse gases, sulfur, nitric oxides, and particulate matter—as 5 million cars going the same distance. Or as the German-based environmental NGO NABU puts it: “a mid-sized cruise ship burns through as much as 150 tonnes of fuel a day, emitting as much particulate matter as one million cars.” NABU has therefore tested all the world-leading cruise companies and has come to the conclusion that they cannot recommend a single company from an environmental point of view. However, cruise ships don’t only harm the environment; they threaten the health of their passengers as well. 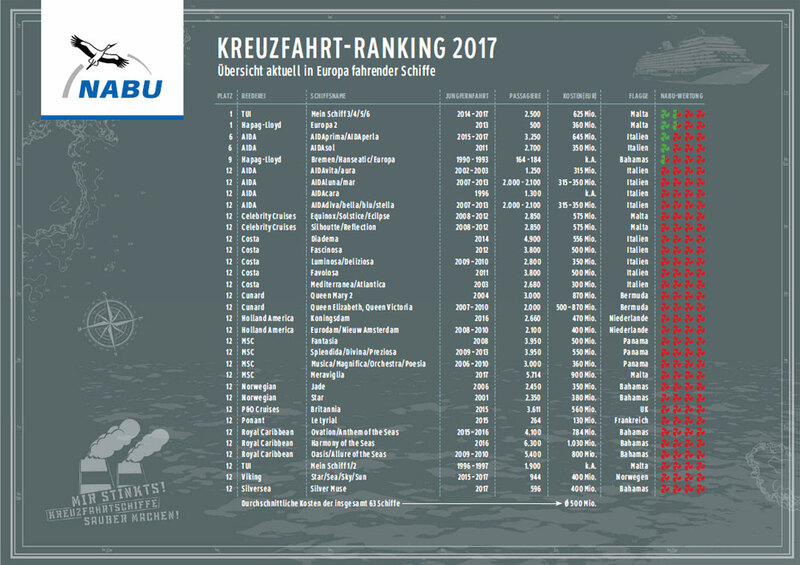 Early this year, a German public television show carried out undercover tests on the AIDAprima, one of the most modern cruise ships, built in 2016 and currently sharing third place in NABU’s environmental ranking. The AIDAprima was built to tackle a lot of the current environmental problems with cruise ships and promised to cut particulate matter, nitric oxide, and sulfur oxide emissions by 90 to 99 percent through the use of soot filters and the abandonment of heavy fuel oil use. However, AIDA Cruises did not take their promises seriously and did not follow through on their ecological commitment. The AIDAPrima. Photo by kees torn via Wikimedia Commons. Available under a CC BY-SA 2.0 license. One of the highlights of the AIDAprima is its ice-skating rink, popular with kids and young families. The rink is situated at the back of the ship, behind the chimney. Why is that important? Particulate matter travels with the headwind towards the back of the ship. The result is that emissions are especially high there. Tests have shown that emissions in the area of the ice-skating rink are on average five times higher than at an inner-city junction. Since the ice rink is mostly visited by children and families, the implications of this are especially alarming. The Brussels-based environmental group Transport and Environment estimates that pollution from international shipping causes approximately 50,000 premature deaths per year in Europe alone: through chemical reactions in the air, SO2 and NOx are converted into fine particles, specifically sulfate and nitrate aerosols. These tiny particles enter the lungs and are small enough to pass through tissue and into the bloodstream. To reduce the impact of particulate matter, offshore environmental zones were established in the North Sea, the Baltic Sea, and along the US coast. In these zones, the use of heavy oil fuel, which contains 3.5 percent sulfur (3,500 times more than car diesel), is forbidden and ships have to switch to marine diesel oil, which still contains 0.1 percent sulfur. Nevertheless, many regions have not established such low-emission zones, for example the Mediterranean Sea. Cruise ships come and go in Venice, Italy. Photo by Jeroen Komen via Wikimedia Commons. Available under a CC BY-SA 2.0 license. Cruise ship passing the canal in front of Piazzetta San Marco, Venice. Photo by Lothar John via Wikimedia Commons. Available under a CC BY-SA 3.0 license. If you find yourself standing next to Venice’s famous Giudecca Canal, the air can be worse than if you were next to a lignite-fired power plant. During peak season around 10 cruise ships stop in the canal each day and 30,000 passengers disembark. In recent years, thousands of protesters have demonstrated against these huge cruise ships entering the city: they don’t only pollute the air, but also threaten Venice’s delicate buildings and palazzos along the canals. In May nearly 20,000 Venetians voted in an unofficial referendum to keep cruise ships away, with 99 percent in favor of the motion. But things change slowly on the international stage. The UN agency IMO, which regulates shipping, is mainly ruled by smaller countries with a high total tonnage such as Liberia, Panama, and the Marshall Islands. For legal and tax reasons many ships are registered in these countries, which grants them a lot of influence. They use their power to support the shipping industry and to delay the consideration of environmental issues. A small-scale win is that the IMO has introduced a regulation limiting the sulphur content of shipping fuels, which will effectively ban the use of heavy oil fuel once it comes into effect in 2020. However, while the marine oils which will be used instead emit lower amounts of sulfur, they emit nearly the same amount particulate matter. In the absence of swifter action on the part of the IMO and national governments, the main responsibility lies with the cruise companies. If they don’t stick to their ecological commitments, change will come slowly. Last December, Carnival Cruise Line was found guilty of polluting the seas with untreated, oil-contaminated bilge water, using the ocean as a toxic waste dump. Rather than being dumped into the ocean, the oily bilge water that comes from a ship’s engines and fuel system is supposed to be offloaded when a ship is in port and either burned in a toxic waste incinerator or taken to a waste facility. As a result, Carnival—the largest cruise ship operator in the world—now has to pay a record 40-million-US-dollar criminal penalty. It remains to be seen whether this record penalty is part of a larger trend of effective enforcement against companies that pollute the environment to their advantage. On a positive note, some businesses recognize sustainable cruise travel as a new marketing tool. For example Hurtigruten is planning to launch the MS Roald Amundsen, the first electrical hybrid expedition cruise ship, and Viking Line will install a rotor sail on their MS Viking Grace, which is powered by liquefied natural gas. Using sustainable travel with self-defined ecological goals to the company’s economic advantage could be the way forward for cruise companies. The MS Viking Grace. Photo by Mike Louagie / Viking Line via Wikimedia Commons. Available under a CC BY 3.0 license. As these examples show, companies should present alternative solutions that don’t pollute the environment or harm the people on board. While the guests want to explore beautiful scenery, they are also contributing to its destruction. So before we board a cruise ship we should consider this: the hazardous implications don’t stop when the travel ends. And if you still want to enjoy the fresh ocean breeze, it is probably best to book a nice hotel by the sea instead.